Monica Porter's intricately carved serving board and hand-blown glass cloche display treats in style. Baked goods. Whether you like them light and flaky, rich and fluffy, or both (our vote's for both), they deserve to be shown off in all their glory. Display sweet treats in Monica Porter's elegant serving board and cloche combo, and let them shine for brunch buddies and dinner guests to admire. Each teak serving board is hand-carved with an intricate pattern that might be even more beautiful than your rainbow macarons. 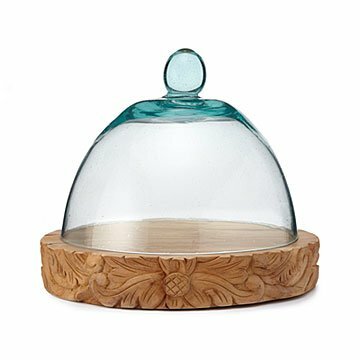 Paired with the hand-blown glass cloche, it's a charming way to serve everything from simple sugar cookies to your most elaborately decorated cupcakes. Designed in North Carolina. Handmade in Indonesia. Monica Porter's mother frequently hosted formal dinners. She had an eye for simple and elegant design, so when she'd tell Monica, "You should be the one setting the table. You do it so tastefully and beautifully," it meant something. Those words, combined with stories shared over meals, ignited Monica's passion for table settings, entertaining, and food. Today, Monica continues the tradition of creating memories at the table through her handcrafted designs. Each is artisan-made to highlight versatility and functionality, using only the finest materials. She and her husband, John, use her pieces in their own home in Greensboro, North Carolina, where they entertain often. Rinse immediately after use, do not submerge in water. Glass cover must be hand washed.